Lisa Olson, who recently became of member of the artists-run Bromfield Gallery in Boston, lets us peer into her studio, where various machineries (both mechanical and creative) produce enigmatic works of art. 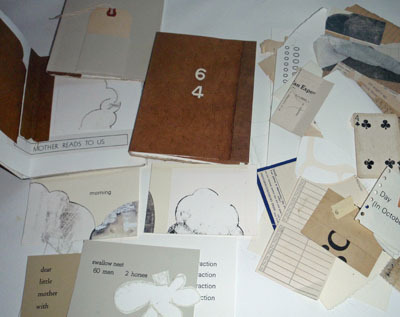 Most of my current work is on paper: artists’ books, prints, drawings or collage. I often juxtapose text and image as parallel elements, allowing both to supply meaning. 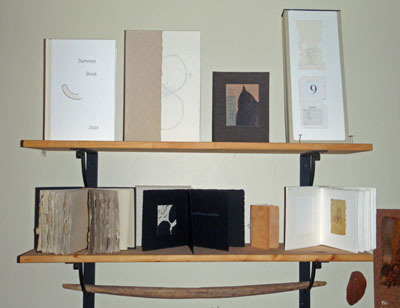 I began making books because of this interest in integrating text into visual art, but now find myself bringing text back out of the book–often incorporating it into collage or prints. I believe that the best artwork comes from a combination of intuition and thoughtful direction, but I often find that the little critics who sit on my shoulder and ask “what does it mean?” or “why does this matter?” try to take charge. To compensate, several times a week I allow myself to work on quick unedited collaged projects, purely fluent and intuitive. This summer I have been making a series of small 3″ x 5″ collages which incorporate fragments of text and image and also simple 4-6 page collaged books with no or minimal text. The rules are simple: I am not allowed to spend more than a two or three hours on each and I am not allowed to think beyond the simple exercise of the small work–it often takes effort for me to accept that everything shouldn’t be better or bigger. 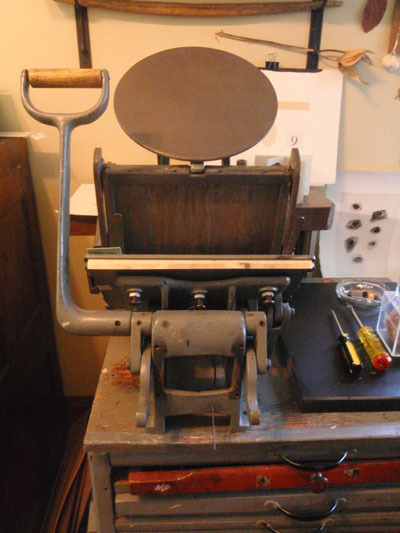 I have two letterpresses in my studio, a small tabletop Kelsey platen press and a larger Vandercook proofing press. 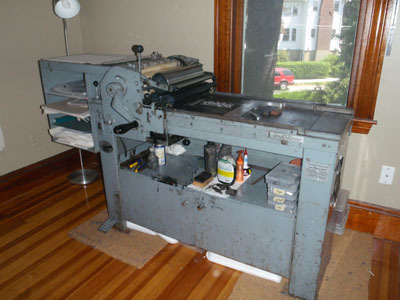 The Kelsey dates from the 1940’s and came out of a commercial print shop on Cape Cod. I purchased it from John Barrett at his Letterpressthings resale shop in Chicopee. The Vandercook is newer, it was made in 1969, and moved around among businesses in the Los Angeles area before winding up in a barn in northern California. The International Printing Museum in Carson, CA acquired it with other printing equipment and because this type of press was already represented in their collection, I was able to buy it. Both presses came to me encrusted with grease and soot and ink, and the countless hours that I spent cleaning them with a toothbrush, steel wool and WD40 not only taught me something about how they worked mechanically but also felt like a devotional act. These types of old presses are still around but becoming more difficult to find, and I am thrilled to have both of them in my studio. 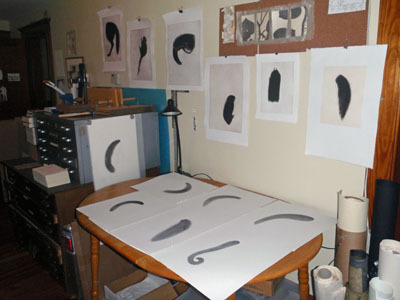 I am currently working on a series of images, dark drawings and etchings of animal forms silhouetted on white paper. I’ve made dozen of these images in the last year and don’t seem anywhere near finished yet. I’m still considering what they might mean and why they have captured my attention. I think that there is something about the dual nature of the images — both monster and sweet thing — and about their formal properties, the shapes created and the lovely repeated graphite and ink marks that represent fur and make up the forms. I think they work as a grouping rather than as individual images and perhaps are also about quantity and accumulation, themes that I have frequently worked with in the past. All images courtesy of Lisa Olson. You can see some of Lisa’s finished works at her Bromfield Gallery artist page.